South of Africa is proud to present the latest addition to its portfolio – the Lovebird unit at Birdsong Cottages. Even though the familiar exterior of the stone cottage at Birdsong heralds back to the property’s heyday of weddings hosted here when it served its purpose as a chapel, Lovebird came to be after a necessity was identified to offer more 1-bedroom units at Birdsong. 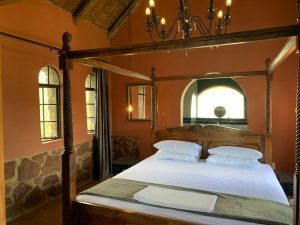 The converted thatch-covered stone cottage is a romantic 1 bedroom unit with private bathroom, open plan living and dining area with kitchenette, deck and sparkling splash pool overlooking the valley below. Its opening just days before Valentines Day makes Lovebird the ideal cottage for a getaway for two in the heart of the Bushveld. Lazy by the splash pool while soaking up the African sun or enjoy open plan living in the spacious living room / kitchen with its high ceilings. Book Lovebird now by contacting South of Africa Central Reservations on 014 004 0131 or click here to book. Read more about this cosy stone cottage here.